Characters: Tom Filsinger, Rob Beaubien and Kevin Butcher (FTR contest winner). The future is here! Welcome to a brand new pocket of the vast Champions of the Galaxy universe, the FTR! FTR is an innovative new developmental league headed up by none other than GWF legend, Encubus! FTR wrestlers most often fight amongst themselves in an intimate arena on Maffei II that holds about 1500 fans named the FTR Launching Pad, or the FTR-LP for short. FTR produces a live weekly wrestling show called “Elevation” and it’s already one of the most respected independent feds in the cosmos! In addition to the exposure FTR gets from Elevation, sometimes FTR wrestlers are booked against each other on the undercard of GWF shows thanks to Encubus’ strong relationship to the GWF. As always, it’s up to you promoter! What are you waiting for? If you haven’t ordered the FTR pack yet, do it now! Chip Tomahawk is a highly decorated high school level athlete making waves on his home star, Cetus, by forgoing college-level athletics to sign a prospects deal with FTR. A natural athlete, Blue Chip will be a popular new fighter, but the young and naive wrestler will have his hands full taking his game to the next level in FTR. Only time will tell if his decision was the right one. In the ring, Blue Chip uses his athletic background to test his opponents, trying for wrestling take downs, tackles, and various pinning combinations. Blue Chip shows loyalty to Cetus with True Blue, an ode to the Indian Death Lock, a maneuver passed down to generations by Omega. His finisher, CETUS SUPLEX, is Blue Chip’s attempt to master a classic maneuver from his home star. His name says it all. Disciple of Terror is a devout follower of Comrade Terror/Dreadnaught from Cygnus. Self-trained using the methods of Dreadnaught, Disciple walks around with a with a chip on his shoulder, an angry young man looking to put his star system back on the pro wrestling map beginning in FTR. His move set is learned from studying the career of Comrade Terror, and then Dreadnaught. Cygnus Rising is a double running ax-handle, Dreadnaught Drop is an Atomic drop and Feel the Terror is a variation of Comrade Terror’s famous Terror Face Claw. His finisher, ATOMIC WARHEAD, is a tribute to his Cygnus idol, the same variation of a tombstone piledriver used by Comrade Terror. Disciple has some natural feuds in FTR with Faller and Blue Chip. 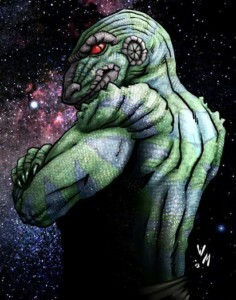 Comrade Terror once feuded with both Massif and Earthquake in tag action as Alien Corps vs. Powerhouse. Will Disciple find a tag partner and challenge his rivals in an attempt to restore Cygnus glory to the galaxy? Look out FTR, the TERROR is back! Note: Disciple of Terror created by Kevin Butcher. Faller is just starting his training to become a professional wrestler. At nearly 300 pounds, the friendly giant will be an intimidating sight in the ring. And one of his moves, Axe Smash, will be popular with the fans, a big chop to the head of the opponent! Faller is a big man, but can he learn to use his power to his advantage? The fans also love when Faller signals that his finisher is coming. He shouts “TIMBER” and throws his opponent into the ropes and delivers a deadly chop to the chest, cutting his opponent down to size! Sometimes Blue Chip teams with Faller in tag action, somewhat reminiscent of when Massif (also from Cetus) teamed with Earthquake as Powerhouse in the GWF. They do not have an official team name, but their fans affectionately call them Chip Chop. Note: Faller created by Tom Filsinger. 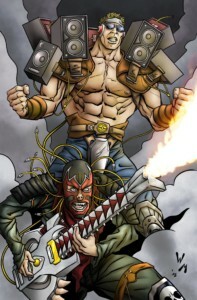 Totally Awesome and the Electric Axe are two reckless youths from the wastelands of Maxus. What they lack in experience and skill, they try to make up for with their wild head banging ways! For starters, their ring entrance is completely wild! Totally Awesome comes to the ring strapped with armor that transforms him into a living boom box! Awesome showmen, the Electric Axe then plays their heavy metal theme music through his tag partner with his incredible flame throwing guitar! It’s a totally awesome spectacle! In the ring, Totally Awesome is the muscle, and the Electric Axe is the speed maniac on the team. Totally Awesome throws his weight around with moves like Soundwave Spin, an airplane spin drop, Monster Machine, a basic choke slam, and Mass Effect, an effective powerbomb. AWESOME FINISHER is a full nelson submission, powerful thanks to Totally Awesome’s impressive strength. Totally Awesome is a confident young man with impressive power, but he’s also a giant green lunk in the ring as he learns the ropes in FTR. The Electric Axe is a manic on the guitar, and in the ring! Lacking the skill for an effective wrestling finisher, he instead turns to his trademark flame throwing guitar when desperate for a victory. Once per match, the Electric Axe can try to KO his opponent with SMASH WITH GUITAR, or even worse, blow fire in their eyes from his axe with FLAME THROWER! FLAME THROWER is harder to pull off behind the refs back, so it’s a riskier finisher. For a team learning the ropes and looking to make waves, it may be a risk worth taking! The Electric Axe uses other cool moves like Maxus Mania, a diving somersault, and the Electric Axe handle, a top rope falling axe handle drop. Metal and Chrome is a tag move where Totally Awesome back drops the opponent straight into a dropkick from the Electric Axe. Maxus Mania squares off vs. the Natives of Castillex in what might be the most colorful and wild jobber tag feud ever! 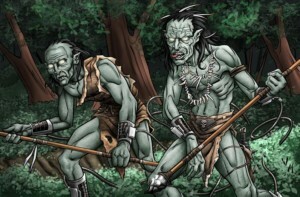 Note: Natives of Castilex characters and story by Tom Filsinger. Swerve is an unpredictable young man from Titan, Saturn, but he’s far from your average Titan. Instead of taking the typical Titan route to success, he attempts to leave the audience in shock and awe with cheap tricks and bizarre behavior patterns! Forgoing classic Titan traits like patience, respect for the sport, and commitment to training in the art of the Titan wrestling style, Swerve instead keeps fans on their toes with wild heel/face turns, battling a popular hero on one fight card, then challenging a hated villain the next! In the rare occurrence that Swerve earns the trust of a desperate ally and/or tag team partner, it’s only a matter of time before Swerve changes direction abruptly and turns on his partner! Or is it? You never know with Swerve! To say Swerve makes a lot of enemies in FTR is an understatement! Swerve plans to hot shot himself into the big leagues and doesn’t care who he has to cross to get there. His primary goal is to entertain the FTR fans, who are always on their toes, wondering what Swerve will do next! Swerve is completely unpredictable in the ring. Sometimes he wrestles as a face, and sometimes he wrestles as a heel. Often times, he changes styles mid match! Then changes again! Heel Turn is a dastardly low blow. Face Turn is a crowd pleasing 619 kick. Ratings Spike is a spear performed with great deception, as Swerve hits the move from behind his opponent’s back. Abrupt Change of Direction is another nefarious maneuver where Swerve starts out like he is going to throw his opponent into the ropes, then violently whips them backwards into a backside beheading clothesline. Swerve’s erratic behavior is highlighted with his two finishers, TITAN DROP, and TITAN SWERVE. Most times Swerve will try to win a match with TITAN DROP, the classic variation learned by ever young Fighting Titan. Swerve, of course, never going through traditional Titan training with Lord Nexus, has put his own spin on the Titan Drop with TITAN SWERVE! Sometimes, Swerve will pull a foreign object of out his tights and smash the unsuspecting opponent over the head while hoisting up on his shoulders for the Titan Drop. This illegal swerve can get Swerve disqualified, but a jobber like Swerve will do what it takes to get noticed, a when it works, it’s the ultimate Swerve on a stunned opponent! 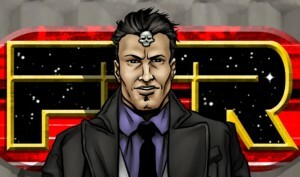 Encubus is the head trainer and general manager of FTR. Sometimes FTR recruits wrestle on the undercard of major federations like the GWF. Use this FTR booking chart when you want Encubus to help decide who steps up under the spotlight! As always, be creative! It’s up to you, promoter! 2-3 One of the major champions needs a warm up match before a big title defense. Pick any two FTR wrestlers (or tag teams) to fight. Winner(s) gets the opportunity of a lifetime! 4-6 Encubus books a tag team match to open the show. Pick two tag teams to curtain jerk your next GWF show. Winners are invited back to fight a GWF tag team on the next fight card. 7-9 Encubus books a singles match to open the show. Pick two opponents to curtain jerk your next GWF show. Winner is invited back to fight a GWF singles wrestler on the next fight card. 10 –11 Big time! Encubus books two FTR matches to open your next GWF fight card, one tag match and one singles match. It’s up to you, promoter! 12 – Encubus pulls off a home and home series with the GWF. One of the major champions will make a rare title defense on your next FTR show. Encubus books a four man tournament to open the next GWF fight card. Winner gets the title shot in FTR.